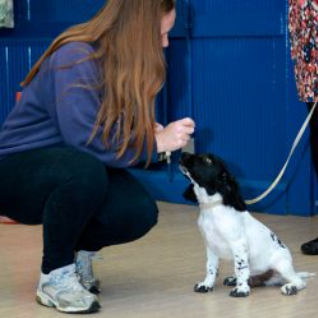 An introduction to training for puppies of all breeds aged 3 to 5 months old. No previous training required. This class introduces heel work, come, sit, down and stay. Cost: £125 for the course. 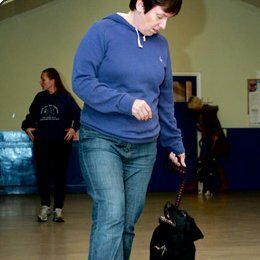 Basic obedience training for puppies and dogs aged 5 months or over, including adults. No previous training required. This class covers heel work, sit, down, come, stay and wait. Wednesday evening 7:00 to 8:00 PM in Brookwood Memorial Hall. Cost: £135 for the course. Next BEGINNER course: Wednesday 1st May. 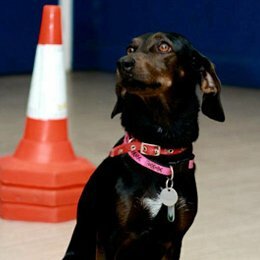 Obedience training for puppies and dogs aged 5 months or over, including adults. 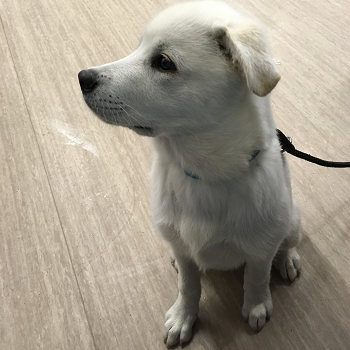 Previous training required, minimum of 6 weeks at Puppy or Beginner level. Saturday morning, time 9:30 to 10:30, at Merrist Wood College. Wednesday evening 6:30 to 7:00 PM in Brookwood Memorial Hall. Cost: £112.50 for the course. Further obedience training for dogs aged 8 months and over. Previous training required, minimum of 12 weeks at Beginner level. Must have solid stays, both in sit and down, as well as a good recall. We cover stand stay, retrieve, finishes, recall from the side, recall to heel, send away and distance control. Wednesday evening 8 to 9 PM in Brookwood Memorial Hall.